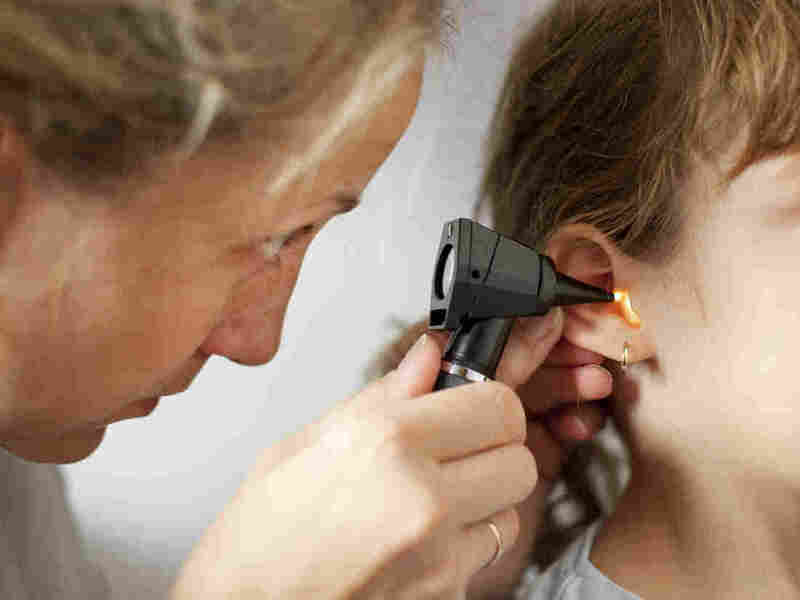 Cutting Back On Antibiotics Doesn't Work for Children's Ear Infections : Shots - Health News Cutting by half the time that children are given antibiotics for ear infections didn't do as good a job, a study finds. And it didn't reduce antibiotic resistance, which was a key goal. Researchers looking into whether a shorter course of antibiotics would treat young children's ear infections as well as a longer course found that not only was the shorter treatment less effective but it didn't reduce antibiotic resistance or side effects. The study, published Wednesday in the New England Journal of Medicine, comes as physicians and researchers are looking for ways to curb the unnecessary use of antibiotics, including the possibility of using them for a shorter time against some common infections. The goal is to prevent bacteria from developing resistance to antibiotics. While that strategy didn't pan out in this particular study, shorter antibiotic courses are still being used and studied in other contexts. The study included 520 children between 6 and 23 months old who were diagnosed with an acute middle ear infection, a very common childhood illness. Half of the children were randomly assigned to receive 10 days of the antibiotic amoxicillin-clavulanate, while the other half received five days of the drug plus another five days of a placebo. If the children experienced another ear infection during the period they were in the study, they received the same treatment. Parents, researchers and clinicians didn't know which treatment a child was getting. The kids were tracked for the severity of their symptoms and had regular office visits to check their health, plus additional visits if they were ill. The researchers also checked to see if their throats had been colonized by bacteria that were resistant to the antibiotic. The researchers found that initial treatment failed in 34 percent of the children treated with the five days of antibiotics, compared with 16 percent of children who had the longer treatment. Symptoms were also worse in the group that received the shorter treatment regimen. And there was no difference between the groups in the rate of colonization with antibiotic-resistant bacteria. The results were a surprise, says Dr. Alejandro Hoberman, chief of the division of general academic pediatrics at Children's Hospital of Pittsburgh and an author of the study. "I also expected that if you used an antibiotic for a shorter period of time, there would be fewer adverse events," he says. But that didn't happen; rates of diarrhea and diaper rash, both of which are side effects of antibiotics, were similar in both groups. The authors said the findings can't be generalized to children who are older than 2 years, or to adults. A 2010 Cochrane Review of research found that using antibiotics for less than seven days increased the likelihood of treatment failure. But Hoberman says many of the previous trials had some flaws, including less strict diagnostic criteria. This study was designed to address those gaps. "This study really shows the importance of doing clinical trials," says Dr. Helen Boucher, an infectious disease specialist at Tufts Medical Center and a member of the board of the Infectious Diseases Society of America. There's a push to see if the optimal dose of antibiotics could be shortened in some contexts, but that has to be studied with specific combinations of infections, antibiotics and patient populations, she says. "The whole notion of really figuring out the optimal duration of therapy is one we've been advocating heavily for." For example, a study of a shorter course of antibiotics against urinary tract infections in children is ongoing. And based on the existing research, the IDSA and the American Thoracic Society recommended earlier this year that most patients who develop pneumonia in the hospital receive a short course of antibiotics. Another prong of the strategy is to limit the use of antibiotics to bacterial infections, says Dr. Pranita Tamma, a pediatrician and director of the pediatric antimicrobial stewardship program at the Johns Hopkins University School of Medicine. Parents often come to the doctor when their kids have upper respiratory infections, but most of those are colds caused by a virus and can't be helped by antibiotics. A 2014 study found that displaying posters in exam stating the clinicians' commitment to avoiding unnecessary antibiotic prescriptions for upper respiratory infections lowered the rate of inappropriate prescriptions. "Antibiotics can be lifesaving when used properly," says Tamma. "But every day that an antibiotic is used, whether it's indicated or not, can put you at additional risk."